Every year in March, The New York State Maple Producers Association has celebrated the amber deliciousness that is maple syrup with Maple Weekend. 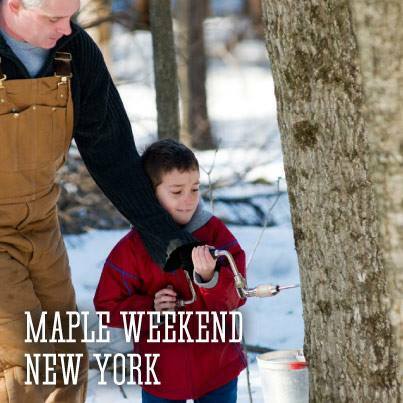 This year, the 19th Maple Weekend will take place on March 22-23 and 29-30 when, between 10am and 4pm, more than 110 maple producers across New York State will open their doors to the public to teach the secrets of sapping and offer their finest maple products for tasting. Because, after all, what would pancakes be without maple syrup? They would be flat cakes. That&apos;s all. Maple syrup makes things heavenly. We&apos;ve compiled a few Maple Weekend highlights below to get your mission for maple well underway. For 40 years, the Galusha family has been a passionate pioneering force in maple syrup production and today they are the largest producer of maple cream, syrup, sugar, and candy in Warren County. Every year they process sap from 3700 trees on state of the art, energy-efficient equipment that includes a wood-fired evaporator and a reverse osmosis machine. During Maple Weekend you can drop in to the farm, taste a whole range of maple treats, and see exactly why they&apos;re so successful. Before starting a day of maple exploration in the Catskills, why not stop in at Catskill Mountain Maple for a fortifying, complimentary breakfast of pancakes, egg and sausage? Breakfast is served until 2pm so you&apos;ll have plenty of time sit and savor the locally produced maple syrup before taking a tour of the plant and learning exactly where it comes from. Watch as staff members demonstrate how to collect sap using a traditional tap and bucket, and learn how to make your own candy and maple cream. Catskill Mountain Maple, 65 Charlie Wood Road?, DeLancey, New York 13752? This year marks the 50th anniversary of this family-owned restaurant and Maple Weekend attendees can celebrate with Cartwright&apos;s classic all-you-can-eat buckwheat pancake breakfasts featuring maple syrup produced in the basement of the building in which you&apos;ll eat. Take a tour of the plant and then pick up some pancake mix and syrup in the gift shop so you can have a Cartwright breakfast at home anytime you want. 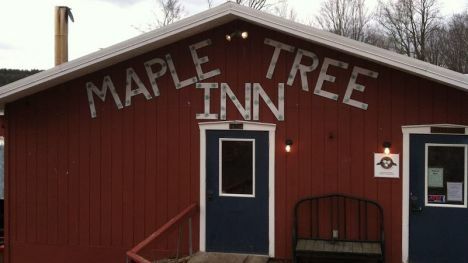 Cayuga Nature Center celebrates Maple Weekend by hosting Maple Fest, an all-inclusive event featuring syrup samplings, crafts and games for kids, live music, tours of Sugarbush, animal programs, craft vendors and a pancake breakfast both weekend mornings from 10 a.m. to 2 p.m. Adult entry is $12 and a family pass is $35.